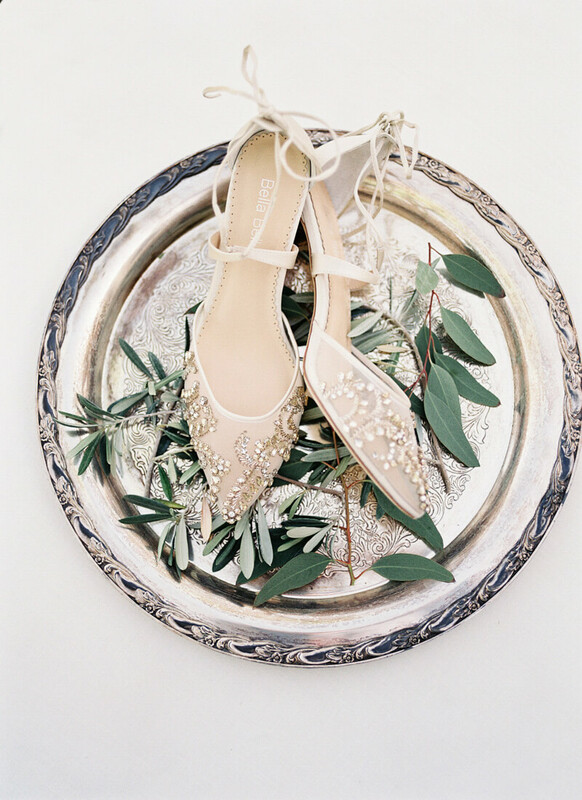 This styled shoot brings the French countryside to Arizona! Located at the Farm at South Mountain in Phoenix, this inspirational design features classic touches, earthy tones and ample texture to create a wedding worthy of a European escape. And because of its smart use of design and location, one would never know it was in the heart of the Southwest. The bride is barefoot and beautiful! She wears her hair down in long, loose locks and dons a lace fit-and-flare gown to complete her look. The flowers teem with classic white blooms and ample greenery to tie in the scenery of the farm. She is joined by the groom who wears a handsome gray suit and light blue tie to complement the serene and airy ambiance. Many aspects of the design incorporate the farm’s fresh appeal. Even a charcuterie table is filled with all farm-grown items hand-picked just that morning. The reception table allows the couple to dine with their dearest loved ones in a rural and romantic setting. The table is draped in a white runner and decorated with tall white taper candles, a plush centerpiece that echoes the greenery of the property and a unique collection of plates and flatware. In addition to the hand-picked charcuterie display, a local bakery provides delicious warm pies for guests to enjoy. With the sun emanating glorious brilliance on the farm, the couple is bathed in bright light as they share their quiet, peaceful love. And of course, the shoot would not be complete without the addition of their beautiful, furry white friend, whose love and support brings the entire experience full-circle. This French-countryside styled shoot truly capitalizes on the natural and earthy radiance from the setting. Focusing on the greenery, the sunlight and the environment, this shoot captures the true essence of the countryside aesthetic. Paired with a happy, beautiful couple, it’s the epitome of a rustic, romantic fairytale.